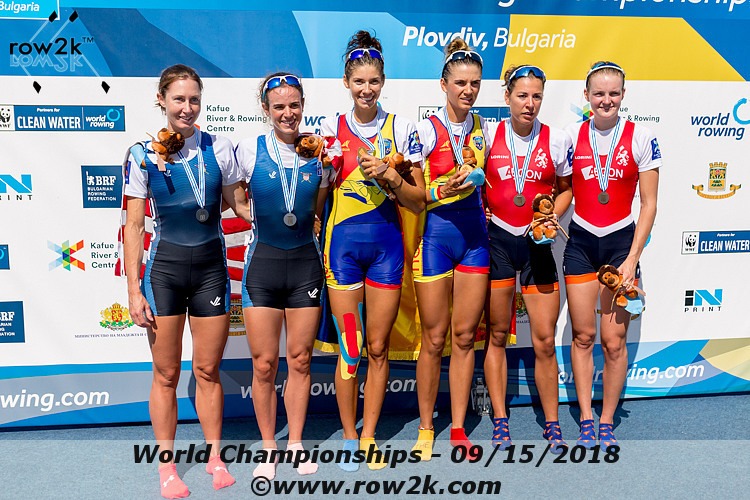 Mary and Emily (left) on the podium of the lightweight women’s double in Plovdiv. Photo courtesy of Row2k. The Boston Rowing Federation athletes and coach had quite a regatta in Plovdiv. First and foremost, Mary Jones Nabel, rowing with Potomac’s Emily Schmieg, finished second in the Olympic Class Lightweight Women’s Double Sculls. In 5th place until the 1500, Mary and Emily had a brilliant last five hundred and rowed through The Netherlands, Switzerland and Great Britain on their way to a second place finish behind Romania. This is the first time the US has won multiple medals in the event in the same quadrennial since Sarah Garner and Christine Collins in the 1997-2000 Olympic Cycle. Competing in the Lightweight Women’s Quadruple Sculls, Hillary Saeger and Christine Cavallo finished 4th overall, less than two seconds behind the third placed German crew. This was the best result for the US in the event since 2013, when Hillary and her US teammates won a silver medal in Chunju, South Korea. Finally, Coach Adrienne Martelli’s PR3 Women’s Pair (Dani Hansen and Jackie Smith) competed in the C final of the OPEN women’s pair, after the two other entries in their event withdrew due to injury. While the lack of competition was very unfortunate, expanding the para event schedule is a great step for rowing, and we look forward to eventually seeing this become an event on the Paralympic program. As the curtain falls on the 2018 elite racing calendar, we want to thank all Boston Rowing Federation supporters for their contributions in helping these athletes get one step closer to their Olympic dreams. The ability to get water time in the winter and to compete at multiple World Cups are absolutely key to continued improvement and success on the road to Tokyo. And, as we welcome back Olympic silver medalist Gevvie Stone, and potentially look to support a lightweight men’s double, and expand our para-rowing support, we hope that you continue to support our efforts. The pre-Olympic World Championships are particularly important, as countries can secure a spot in the Olympic Games by placing in the top 7 for the lightweight doubles, and in the top 9 in the women’s single. Meeting this qualification criteria is not only a key indicator of success, but also allows the athletes to avoid the Lucerne Qualification Regatta in the Olympic year. Once again, thank you for you support! We look forward to a great 2019!